Snowflakes come in a myriad of shapes. This covered jar is one of my interpretations. 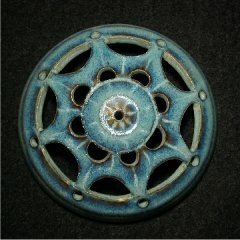 Stands 3" in diameter x 2.5" in height. This picture just shows the top. It is wonderful for jewelry, a special item, coins, odds and ends you want to keep and of course potpourri. Looks lovely on a dresser or as a conversation piece on a coffee table. Gives a beautiful scent of your choice of potpourri (not included) for your bathroom or any space. Must be ordered.